Now you can make fresh coffee with the help of this Doctor Who French Press. This is a Tardis coffee maker, the glass carafe comes with a stainless steel plunger and has Tardis blue holder on the outside and even has the door and top sign of the famous blue police box. So now you can get your favorite coffee or even grind it yourself and then make some amazing brew in this Doctor Who coffee maker. 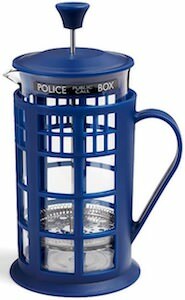 If you are or know a true Doctor Who fan that just loves good coffee then this Tardis French press is what is needed. 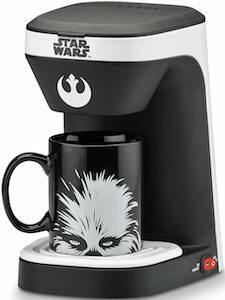 No longer do you have to worry about your morning coffee because not there is this Star Wars coffee maker with mug. The coffee maker is a one cup coffee maker and they added a Chewbacca mug so the only thing you need now is coffee and water and you are ready to start the day. The black and white coffee maker has the Star Wars and Rebel logo on it and comes with a permanent filter to make your life a lot easier. Now everyday you make your Star Wars coffee and drink it from your black Chewbacca mug. 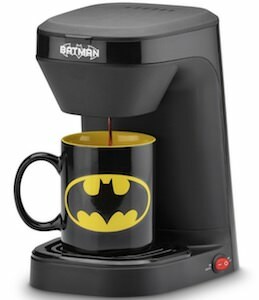 Now there is a Batman coffee maker and that can help you starting your day right. The Batman coffee maker is black and has the Batman logo and name on the top. 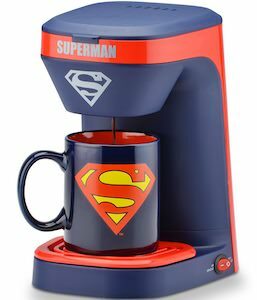 And there is a Batman logo mug included with it so that you are ready to feel like a superhero while drinking your morning coffee. The Batman coffee machine is a single server coffee maker with a permanent filter basket so that besides the coffee maker you only need fresh coffee, water and electricity. 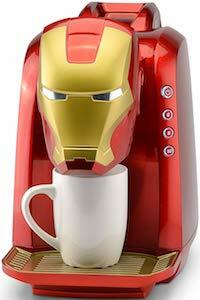 So no more boring coffee maker for you because you can have a coffee maker used by superhero’s. Now Mickey Mouse fans can start their day style thanks to this Mickey Mouse coffee maker. 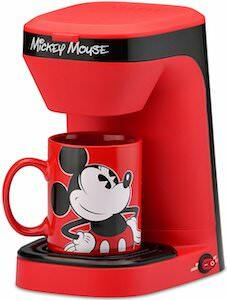 The coffee maker is red and black and says “Mickey Mouse” on it and even comes with a red Mickey Mouse coffee mug . The Disney coffee maker is a single serve coffee maker with a filter basket that is easy to clean and reuse. So now you never have to worry about getting coffee again because your Mickey Mouse coffee maker is ready to get you your morning coffee. And having the fun red coffee maker in your kitchen or office is just fun and will bring some color to your kitchen. 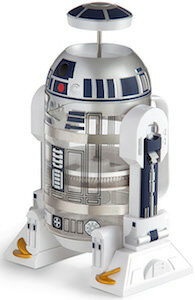 Now you can make coffee Star Wars style with this R2-D2 French press coffee maker. The coffee maker looks like R2-D2 only a lot more see through so that you can see you fresh pressed coffee. Now making coffee will be fun again and that means fewer visits to Starbucks and more fun at home. And the Star Wars coffee press can hold up to 4 cups of coffee so you can drink with friends or just enjoy more coffee yourself. The glass carafe is removable so that it can go in the dishwasher but I am sure a quick rinse will get it ready for tomorrow too.